Kingdom Hearts 3 Famitsu Scans + Translation! Full scans of the 7/4 Famitsu Weekly released last week have surfaced thanks to True Gaming! Last week's issue of Famitsu Weekly covered all of the newest game announcements at E3 2013 like KINGDOM HEARTS III and FINAL FANTASY XV, and contained a Q & A interview with KINGDOM HEARTS series director Tetsuya Nomura where he discussed the possibilities of playing as Riku and Kairi in the long awaited title, the "Kingdom Shaders" created to give each world an authentic Disney look, and more. Don’t forget to follow us on Twitter, Facebook, and Tumblr for all of the latest news on KINGDOM HEARTS -HD 1.5 ReMIX- and KINGDOM HEARTS 3! Thanks to Zephyr for translating the scans! 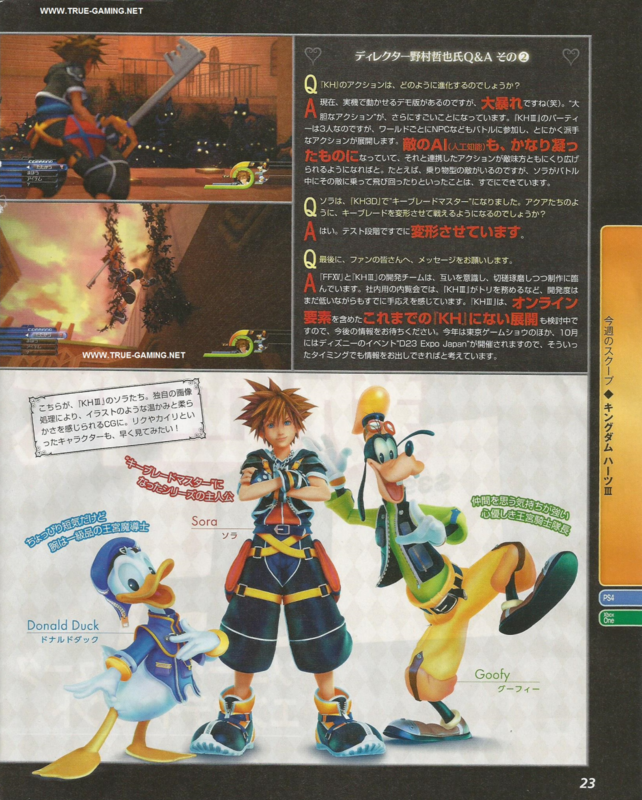 Q: Sora became a Keyblade Master in KINGDOM HEARTS 3D [Dream Drop Distance]. Like Aqua and the others, they can change their Keyblades? A: Yes. During the Mark of Mastery Exam, they already have the ability to change their Keyblades. But what does he mean that the keyblades have changed? Edit: Are the changes similar to how the Earthshaker changes to Ends of the Earth or something like that? I'm thinking it wasn't a physical change but a...metaphysical thing...but the kanji implies the physical. It is what the interviewer asked. Most interviewers and people who didn't paid attention to the ending of the game missed the fact Sora didn't become a master. Lol new power I guess. It literally says "Keyblade transformation"
Can't wait for that. Hope they show their new costumes too. Very obviously referring to TAV. Hmm I'm not entirely sure but the text says Keyblade Master in the question and his character bio. Perhaps the term is more loosely interpreted in JP releases? Assuming that Riku and Kairi are getting new outfits as well I'm wondering if the new renders of them will be in their new duds or will be like Sora's and depict them in their KH2 attire. I'm eager for new outfits but it'd be nice to get their old ones in upgraded graphics as well. Please look forward to playing as these two. Weird interview. Nomura seems to be repeating the same things but adds small details. In the KINGDOM HEARTS series so far, Sora learns that Master Xehanort is mercilessly plotting to start a war between the Darknesses and the Seven Guardians of Light. [FONT=arial black]King Mickey and Riku are searching for Keyblade wielders who fought in an intense battle before and Sora, Donald, and Goofy are searching for the “Key to Return Hearts”[/FONT]. They will once again travel to various Disney worlds. In KINGDOM HEARTS Birth by Sleep, Eraqus passed down his Keyblade to Aqua and now Sora is holding it. [FONT=arial black]They’re traveling to search for the “Key to Return Hearts”[/FONT]? I guess that concludes that we will be searching Aqua and the Key to Return Hearts is the Master Keeper (?). I guess Sora should find it and Aqua in order to find Ven and return his heart. Excited about the Riku/Kairi renders. As far as the whole "Master Sora" thing is concerned, I'm guessing that Sora is in a situation sort of like what Terra was in during BBS: his power and skill matches that of a Keyblade Master, but he failed the official Exam. However, it could also very well be that KH3 will open up with Sora's Mark of Mastery Test like BBS did. Heck, it could even be Kairi's exam too, if we do end up playing as Sora, Riku and Kairi. Makes sense too since Mickey and Yen Sid were already searching for them beforehand, and while they may know Aqua is in the RoD, they don't know where exactly. Same goes for Ventus' body and soul since Mickey said in Re: Coded he has only an idea about where his heart might be. And about Terra they know closely to nothing. I wonder if Lea will support them during their quest. It is a bit strange, especially the bit about Sora being a Master and "changing"? Keyblades. There didn't happen anything to both Sora's and Riku's Keyblades during DDD. Except, maybe they're referring to the power to awaken sleeping hearts which they gained from unlocking the seven sleeping Keyholes? Maybe that's like a new "ability-unit" added to their Keyblades and that's what it means. Why would the Master Keeper be the Key to Return Hearts? If it would be, Aqua could have already used it back in BBS. We don't know enough about how much time has passed since the events of KH2 ended to deduce something like that. Could be she doesn't know. Aqua didn't exactly have enough time to settle into her new master position before she had to go world hopping because of MX's shenanigans, or even enough time for ME to explain things to her properly either. Or Hell, maybe even ME himself didn't know, the MK seems to be a really old Keyblade passed down from master to master so assuming that it in fact is the KtRH the history behind it may have been lost over time. I'd love to see the Dream Eaters appear again in the beginning of the game. Imagine Meow Wow in those graphics. Why does it say Sora became a master in KH 3D? Pretty sure he didn't. Maybe KH3 starts with Sora as a master for some reason. Or he's just the equivalent of a master. The interviewer asked. Famitsu slapped it in their bio of Sora. Nomura didn't deny it (read: didn't care enough to correct them since he was sick with a cold.) We are all just as mystified. I actually turned off Animal Crossing and switched over to KH3D to read Sora's bio and the Mysterious Tower story summary just to make sure we didn't accidentally miss something for a whole year. I hope not. I want to see the moment when Sora earns his Mark of Mastery. Maybe it'll be a flashback early in the game? But honestly, since the story immediately proceeds DDD, I think Sora will be the same. The interviewer was probably just asking an inaccurate question and Nomura was like "Yeah, sure." "You will see characters such as Riku and Kairi soon." You would at least think Famitsu would get their facts straight. Sora did not become a Keyblade Master in Dream Drop Distance, that was Riku. And the fact that Nomura actually agreed to that makes that worse. I don't want Sora to be a master at all. In power, yeah, but in name? Sora'd probably be like "Master? Oh...right! You mean me, I guess?" Ditto. And I don't mean to sound like... well, a boy, but I'm particularly interested in Kairi. Even her 1.5 render was my favorite of the three. They always make her's look really, really good. It's going to be weird enough hearing "Master Riku" in KH3. The title doesn't even matter. The PoH called Sora a Keyblade Master anyways even though he was just an inexperienced 14 year old boy. actually with 1.5 remix being release, do you think they will edit the keyblade master bit out? I mean before, they didn't think that master would signify anything but the one sole user. But with BBS added in, everything could be retrofit to be accurate. They won't change a thing. All that can be chalked up to is them seeing a boy turn up and saving them, assuming he's the Keyblade Master, and Sora goes on his merry way. No, I don't. He's a master in all but name and Sora already said he doesn't care about the title. We already know he's the main character and hero. It was really the first time Sora's shown a complete disinterest in a title unlike all of the times he's wanted to be acknowledged as a hero, or being boastful about defeating an enemy. Wait... "Keyblade Master"? Did I miss something? Aku = Axel. I think it's because in Japan they pronounce his name as "Akuseru"
I wouldn't mind Sora being named a Master at the end of KH3. It would be pretty lame if he started off with the title in the beginning, might as well have given him the title at the end of DDD. Didn't Sora fail the test? Or am I crazy! It's not that he failed; he just didn't pass. We all saw and heard Yen Sid specifically naming Riku the "new, true Keyblade Master" out of the two, so whatever is going on with Famitsu here is definitely strange. Famitsu could have made a mistake; the interviewer might not have played KH3D, done his/her research prior to the interview, or the questions wasn't checked through properly. It might be a ruse meant to attract the bulk of the worldwide community who didn't touch any of the recent titles and believe that Sora is indeed a Master. Or maybe they're even suggesting that enough time has passed between the end of 3D and the beginning of III for Sora to become a true Master. But whatever the reason, it definitely contradicts everything we've been given prior to III's announcement. Well they can't get to Ven without Aqua and without Sora they can't put his heart back where it belongs. Saving Terra requires knowing just where exactly his Heart is, and since he's considered a Darkness by Xehanort, they will probably have to fight him. So Pretty sure Mickey and Riku will get to Aqua and then group up with Sora, Donald, and Goofy when it comes to Ven, then the big fight against the XIII Darknesses will be when Terra is saved. thats what I thought...just wondering why they worded like that Riku and Mickey are going to save all three. Heck, it could even be Kairi's exam too, if we do end up playing as Sora, Riku and Kairi. I personally would rather Kairi not be taking the test so soon after starting her training to begin with. I would think that she'd need years of training and I know KH3 doesn't take place years after DDD because even if they sent Kairi to a place where time goes by EXTREMELY slow, she'd grow too old. I'm with MS on this one. Don't get me wrong, I know Sora is deserving of the title, but he doesn't need it. I feel like it is cool that Riku was always that older brother figure to Sora and now that he is a keyblade master, that balance is restored. Sora is so special with all his connections to other people that I don't think he needs the title to really be powerful, he's powerful because of his friends, but the idea that in terms of pure keyblade wielding, he isn't the best (since Riku and Aqua are better than him and just wielding), keeps him grounded and prevents him from being this all-knowing keyblade wielder. I CANNOT WAIT TO SEE THE KAIRI AND RIKU SCANS!!!! AND NOMURA HAS A ROUGH BUILD OF THE GAMEPLAY ALREADY?!?!? WHAT I WOULD DO TO BREAK INTO THE HQ AND PLAY THAT FOR A FEW MINUTES >_< Yes...that needed to be in bold because I was screaming it inside of my mind. Apperantly Japanese fans are just as confused over the "sora became a keyblade master" bit. I thought Sora didn't pass the test ? We're all united in our confusion over Sora's supposed mastery! In any case, hopefully they'll clear it up soon. I'm confused. I thought Riku was the only one deemed keyblade master at the end of 3D, but it says Sora was too? Is that just some type of wrong information or did I miss something? If I remember correctly that was a loose translation resulting in two different forms of keyblade master in the NA versions. Sora, Donald, and Goofy are searching for the “Key to Return Hearts”. They will once again travel to various Disney worlds. Is this mistranslated or am I reading it wrong? The way I understand it Sora already have Eraqus keyblade ("
and now Sora is holding it") and they are searching for the "key to return hearts" (let me be the first to call it ktrh/KtRH unless I've missed someone). This also remind me of the keyblade of hearts that Rikunort created in KH I using the PoH. Can't deny the possibility, although Eraqus did have a longer conversation with Aqua after she became a Master and the C.O.-security system might be not the only thing he briefed her own. That would be weird, lol, if Eraqus does not know what his own Keyblade is capable of, not to mention how the hell Ansem the Wise would then get wind of it so that he can place a hint towards it in his data. Last time I checked it was nowhere stated that Riku and Mickey will save anyone. The way it is worded, "searching", can also be interpreted as "locating" instead of "saving". It has been stated multiple times that Sora is the one to save all of those people, RXN, TAV and also Ansem the Wise. Yet Sora cannot do that if he doesn't know where they are, as the current knowledge of Mickey and co. boils down to just "Aqua is in the RoD". They don't know where in the RoD she is and they don't know squat about Ansem, Ven or Terra. They are talking about the scene in the concept trailer, it doesn't have to mean that Sora holds the Master Keeper already when KH 3 starts, not to mention that it is Aqua's blade and not Sora's. KtRH, the next new abbreviation for all the MacGuffins this series introduces, lol. What if "the Key to Return Hearts" is not an actual Keyblade but a "key person" or the combination of the two? Master Keeper is not capable of returning hearts to their bodies per se, but, in conjugation with Aqua, it is capable of unlocking the secret to Castle Oblivion thus enabling Sora to return Ven's heart. Something along those lines. That's also a valid possibility. I don't know where the apparently widespread acceptance comes already that the "Key to Return Hearts" has to be a Keyblade at all. Sora is the "Key that connects everything" and he's a person, in BBS Ventus was the "Key of Light" and Vanitas the "Key of Darkness" and Roxas is called the "Key of Destiny", so persons can be as much Keys as Keyblades are. The transformation of Land of Departure into C.O. is tied to its Keyhole, I don't recall that it was ever stated that it has to be specifcally done with Eraqus' Keyblade. Aqua could have used her own Keyblade to activate the device and get the same result. The key to C.O. is definitely Aqua since only she can find the chamber which holds Ventus, but if the Master Keeper is really needed for that I dunno. The one flaw in your theory though is that this combination "Key to Return Hearts" would work only for Ventus, but Sora has also Terra, Aqua herself, Ansem the Wise, Naminé, Xion and Roxas to save. Or are you proposing that they'll need a different "Key to Return Hearts" for each one? I've thought about that but Eraqus' death (?) and the fact that his Keyblade remained where he was is open to interpretation. Is it just a Keyblade? Is it tied to the Land of Departure as a protective device or would any Keyblade would be able to transform the world into CO, as long as you were the world's protector? In my theory, the "Key to Return Hearts" refers only to Ventus' heart. Sora needs to save the rest and he is tied to all of them but he doesn't have their hearts in him* - nor a way to make Xion, Roxas and Namine into complete beings. So, assuming returning Ven's heart is only a matter of finding him (and he doesn't have to stab himself with another Keyblade to do so), finding Aqua would be the on the top of his priorities and that how we will start the journey. The rest will follow. *except maybe for Roxas - did Roxas gain a heart? i m think we might Kairi and Riku picture at tgs or the other covention for Disney right Sign? So Riku's looking for the other wielders? I thought Sora was supposed to save everybody. And I thought Sora failed his Mark test. And when did anyone's keyblades change during the test? This molasses-esque flow of information is already getting me stupidly anxious for this game. Show us the build, Nomura! This have been brought up a couple of times but you're right, Sora is not a master. It was probably a mistake and Nomura was to tired or something to correct him or we'll see that Sora have taken the exam between 3D and KH III or at the start of KH III. As for the keyblades they probably don't mean that they've physically changed but now they hold the power to unlock/wake up sleeping worlds. Exactly, it's open to interpretation, that's why I would like to know where the premise that only Eraqus' keyblade can activate the mechanism in LoD comes from. There has been no concrete evidence that Eraqus' keyblade is in any way different from all the other ones we have seen so far except the dark Keyblade from KH 1 and the X-blade itself. From the looks of it the protective device of the LoD is tied to its Keyhole, which is located in the chamber of waking which can just be found by the one who created it. Ansem's data is said to have the necessary information as how to bring Naminé, Xion and Roxas back as well as TAV. Sora has four hearts inside him: Ventus', Roxas', Xion's and his own. Naminé's heart is in Kairi. Deja vu. We've had a similar conversation before. Has it been stated that all of them had hearts? Xion, Namine + Roxas (in addition to carrying Ven's heart)? He did say, "use my keyblade." He could've just told Aqua to seal the world with her keyblade, but he went through the trouble of singling out his keyblade. Personally, I think that's concrete enough. It's likely to be released in a scan sometime in the near future. Famitsu got it wrong. We are ALL confused as to why they said that. Lol I hope Famitsu makes a correction note in their next issue because lol none of us get it. Yeah, that was what they said in the English summary as well. Sora can still save them. Their pain isn't related to them not being "found", but the circumstances surrounding each of their problems (Aqua not being able to protect her friends, Terra not having control of his own body, Ven's fractured heart, TAV overall not being together.) Sora can still fix that. If Mickey and Riku find Aqua, she still wouldn't be "saved" because the things that are causing her pain have not been resolved. Even if Aqua leads Mickey and Riku to Ven in the Chamber of Repose, Ven's heart would still be in Sora's so he'd have to go with them. And even still, there has been nothing to say that Sora can't have help to save everybody. I think by this point it should be obvious everybody will be doing their part to help everybody in pain alongside Sora since pain is a burden that can be carried by friends if you let them. Yes, Sora did not pass the MoM. The word in Japanese seems to imply a physical change, but the Keyblade's power did in fact change. The Keyblade now has the power to awaken sleeping hearts. Huh. This was quite the interesting interview:D I especially liked the part about how they debated on going more realistic, or cartoony in their designs. It's something I think we'd all guessed, but nice to hear it confirmed, nonetheless. Personally, I really like what they're doing with the character models, and it'll be great to see how they look when they're a bit more polished. And woot! We'll see something on Riku and Kairi soon? Sweet! And suddenly, I feel less worried about how they're going to treat Kairi in III. I wonder if Nomura meant we'll see the threes new looks soon, or something else entirely. And I'm still hoping the two do end up playable in someway in the final product. Correct me if I'm wrong, but in the past when they received new outfits, we first saw them in a trailer and then in a follow-up magazine feature, right? I took that to mean that we'll be seeing Riku and Kairi's new KH3 renders in the near future like Sora, Donald and Goofy, with the new outfits being unveiled at a later date. 1. The interviewer didn't play KH3D. 2. The interviewer didn't research the latest developments of the story. 3. The questions weren't proofread prior to the interview. And with Nomura being ill and exhausted since E3, he probably didn't care enough to correct them. I don't believe Riku and Kairi not receiving new outfits should even be considered a possibility. why that sign just curious? Third game, finale of the saga. They are going to go all out on this game especially since it is on a next gen console. SRK are for sure ALL going to get new clothes. I'd even expect MDG to get new outfits as well. Regarding outifts I also do not really see why they would need new ones. Sora is understandable as he needs something new so they can get rid of the Drive Forms, but Kairi and Riku do not really have such a thing. If someone really needs a new outfit it's Lea, Xion and TAV, as they only had one in general so far. They've gotten new outfits in every main numbered game. The outfits themselves are six years old. They are overdue for new ones. They are about to go into battle. Really doubt Riku's baggy jeans and Kairi's short dress are proper "battle for the fate of the universe" clothes. Not to mention I think even Nomura dislikes his own KH2 designs seeing how often they honestly avoid using them in lieu of KH1 or new designs. Although if you want to get technical about it, since Kairi is beginning her training she at the very least would need a new outfit. I don't think her super mini tube dress is very practical (not that video game logic cares anyway~). Saying that characters who only have one outfit are the only ones who should receive it is no different than giving one to another who already possesses a more updated design. For the finale of the Xehanort saga, it's really not farfetched at all to assume that all three will receive an updated appearance. I hope they all get new outfits. I don't mind if Terra, Aqua, Ventus, and Roxas didn't since their outfits feel pretty unique/detailed. Donald and Goofy feel a little long overdue and I hope they get a mixture of their royal outfits. Of those, I'd say especially Lea and Xion. Hopefully the game will just start with Lea not wearing that cloak anymore, and Xion can get some new clothes after she's saved (have her off camera in another room resting or something, and then after a while she comes out in new clothes all fresh and stuff). Terra probably will have some Darkness themed stuff with him being one of the Darknesses. Aqua will prob get some new clothes after being getting out of the RoD, which should be early in the game. Ventus can wake up and realize his clothes are too small, ala Sora in KH2. Wouldn't mind Roxas ditching his clothes for something that further separates himself from Ventus either. I think by this point it should be obvious everybody will be doing their part to help everybody in pain alongside Sora since pain is a burden that can be carried by friends if you let them. Everyone EXCEPT Kairi and Lea so far lol Poor Kairi and Lea, nobody knows what you guys are doing (during KH3 I mean) haha xD I'm sure they'll have a story together...I'm still a fan of having their story be related to Maleficent and the PoH. I think that Kairi is the only one who really needs a new outfit since she has no way of getting between worlds (unless she flies in the gummi ship) and her outfit has no special capabilities like Sora's does so her outfit is the worst of them all in terms of fighting with it on, but I'm sure you'll see a new outfit for nearly everyone in the game by the end of it. The only ones I can see keeping their outfits are TAV. SQUARE ENIX DOES NOT CARE ABOUT SKIMPY LOGIC!!! I was thinking that actually. We have one about what outfits Xion and Lea would get, one for what sort of outfits SRK would get would probably be a hotter topic. Definitely not a translation error. The question, when literally translated says, "Sora in KH3D: He has become a master. Like Aqua and co., during the test the Keyblades have transformed?" "変形” means transformation, change, deformation. The second character "形" denotes the physical "shape" or "form", but as we all know the Keyblade has not physically changed, so it seems to mean a metaphysical change in the Keyblade's power. Sora and Riku gained the power to awaken sleeping hearts, which would be a change to the Keyblade's original power of merely locking and unlocking pathways/door/etc. Rule of cool is not a valid reason for me, but meh, whatever. If it has to be, I'd say do it for all of them at some point during the course of the game. Hopefully only as long as he remains MX's lapdog though, I'd also hope that he gets at least some payback at the old coot like punching some of his teeth out if not even getting the final blow in tandem with Sora and Ventus. You do know that Ventus didn't age in that chamber, right? So his body wouldn't have aged. Yet I still think he should get something more lightweight which would be more fitting for his status as an acrobatic speedster. Discuss SRK outfits in this thread! I'm still wondering what this competition could be. There are so many little snippets of info in this interview that really need some expounding. Competing on who can get bits of their game done before the other, it seems. Battle of the assets. Wait. Sora is not a master yet. Is that a mistranslation? 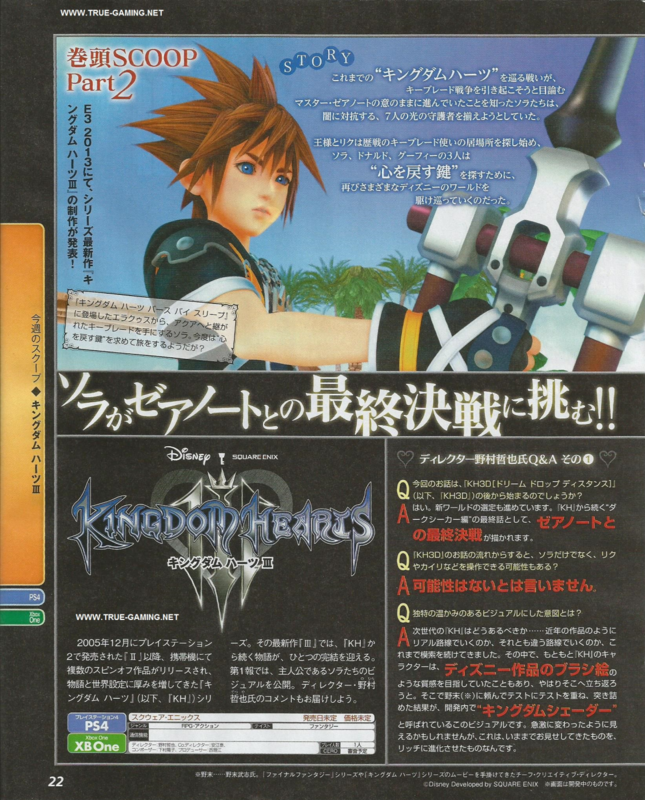 Q: Sora became a Keyblade Master in KINGDOM HEARTS 3D [Dream Drop Distance]. ...um, what? Was this a typo? I don't know how realistic I am comfortable with Kingdom Hearts eventually becoming. I do like the richness we saw in the trailer, I just hope it doesn't get too cray. Really looking forward to TGS. I sure hope it looks better than that! No, just a sign of someone probably getting fired. We've been explaining this at least twice on each page so far in this thread lol. It's not a typo, but a clear fault on Famitsu's part that wasn't corrected. Hopefully they'll clear it up in their next issue because this is causing a lot of confusion worldwide. Wut? Like srsly? o_0 This mean I'm gonna be flowmotioning off NPC's heads now? And omfg yes, they always make Kairi look amazing.♥ I honestly can't wait to see her outfit more than anything! Nah, that was an interview error. Am I the only one that wishes these interviews had more new info than bits and scraps? Can't expect too much from a game that's barely been under development so far, no? lol I like how barely anyone has really discussed this (including myself) but come to think of it, it really does sound awesome. I'm curious if what the NPCs are doing will actually cause damage or if it will be like in FFXIII where they are clearly attacking the enemies, but really, it's all for show. On that note, now that he's mentioned NPCs becoming more vital to KH, it's time to deliver. If KH3 has a lack of NPCs and that kind of stuff is sparse, it'll be a huge disappointment to me (the NPC part, not the whole game). It reminds me of Final Fantasy XIV because NPCs can also partake in battles in certain occasions. They guard gates and stuff. I'm curious as to how exactly they help in the flowmotion aspect. xD They gonna act like the poles and rails in DDD or are we gonna throw them like reality shifts in Traverse Town. I hope it's mostly for show cause I'm afraid a whole crowd helping you fight could take away from the difficulty. It'd be cool for NPC help during boss fights and some large enemy crowds though. Agreed, hopefully we at least get a area or two populated by NPC's this time. Also, I think what they meant by NPC's in battle is what Hercules did in KH2. I recall he wasn't a part of the party, but he still helped you defeat Hades with his hero abilities. I think the change it's referring to is the inside, like their new found ability to awaken sleeping hearts. Lol, do I see a possibility to have that jumping, squeaking Sausage as a summon perhaps? And yeah, this variant of the interview does make more sense overall. Given that neither Sora's nor Riku's base keyblades changed after unlocking the 7 keyholes, I think it's safe to assume that they'll be staying the same (especially Kingdom Key, given its symbolic role in the series). In fact, if Riku ever obtained keyblade armor and a glider, they'd probably be based off of WtD's design, or at least to a certain extent. I always thought it made more sense to work that way, like the Hydra battle. The only thing I hope is that those reactions with the NPCs (if it worked that way) aren't vital nor overpowered. If they are too good, they'll be spammed like reaction commands and that makes the game much easier. I'd much prefer if they were just there to see them when you want but not necessary to use them. That's pretty much my feelings on it, more of scenery than party members.